Primp Powder Pout - a Make-Up Artist's Life: Top Makeup Tips for Your Corporate Image! Top Makeup Tips for Your Corporate Image! As the world becomes more and more focused on branding, marketing image, it’s becoming apparent that we are truly working within a very visual world. Image is becoming everything. As much as we try to stick to 'Don't judge a book by it's cover', when it comes down to business, it happens more often than you think. Companies big and small, spend a lot of money working on their branding and image so that they appeal to the clients they are after. It’s difficult to stand out and this is why so much focus is on branding. But branding doesn’t stop with the company’s image; it also trickles over to the business women and men who run these businesses. So this leads me to your personal appearance and why it’s important for your business. Did you know that in less than a second, you can imbed a lasting impression on people you have only just met? According to Business Insider, not only does it take less than a second to make an impression but even if you were to stand in front of this stranger for longer periods of time, that first impression is still imbedded in their psyche and it ain’t goin anywhere! Women and men who are in the front line of their company’s, appearance can have a big impact on the success of the company and how they are viewed. This isn’t just face to face meetings, but is also corporate images, video calls, filming and interviews. Looking after your appearance can give away a lot to customers and clients. How you look can reflect your own self esteem which can directly affect the look of your company and its well being. Here are some important things to think about when looking after yourself and making sure your first impression is a good impression! 1.When meeting clients face to face, wear makeup that is naturally enhancing. Eyeshadow is a great way to enhance the eyes. Keeping the colours neutral is the best way to go. Go for eyeliners and mascaras that enhance the eyes. Heavy eyeliner and spidery mascara can be distracting! Foundation is a great way to even out your skintone. Ensure the colours you use, match your neck and chest. Bronzer and blusher are a great way to add some life back into those cheeks. However, stay clear of shimmery, orange toned bronzers all over the face and crazy bright blushers. We’re trying to look naturally awesome not artificially spectacular! 2. When doing corporate filming and photographs, the makeup and grooming techniques are a bit different that the above! Men and women, keep it matte! It’s easy to become shiny under the harsh lights of filming and photography. If you don’t have a makeup artist at hand, then wearing a matte blotting powder and/or foundation will help. Also, pro tip- bring tissues to blot your forehead with. Try to stay away from sparkling and shimmering shadows. They can reflect the lighting and it can bounce back on camera. This goes for men or women - ensure you have some warmth in your skin. Lighting on filming and photography can bleach it out so adding a neutral bronzer around the forehead and across the cheeks can help give back that healthy glow you want. Its OK to add a little more colour to the face including the eyeshadow, blusher and lips! You can add a bit more eyeliner to the tops and bottoms of the eyes just to enhance them for the camera. Not all brands are the same and some are more edgy and trendy than others. Its about finding what works within your corporate environment and running with it! If your brand is representing something that is for a younger, more artistic or creative audience , then its obvious that how you represent yourself may need represent their style a bit. However, no matter what, your image affects the way your company is viewed, so make sure you represent your product/business by looking after yourself. Every business style is different, so make sure you ARE the brand! 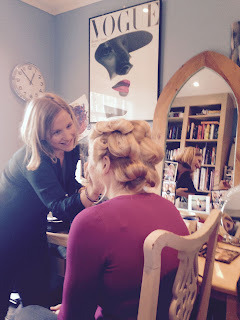 You'd be surprised who require corporate makeup and under which circumstances! On the job with one of my many corporate clients! If you need more advice or training on corporate image, beauty and grooming, please get in touch! My team of talented artists is happy to help!